There’s never a moment to waste at Initial Impact, Dale and Donna Szakats’ promotional products store near the big sand beaches of Spring Lake, NJ. Their shop on Warren Avenue, which was established 30 years ago, works hard to keep up with the influx of customer orders for its custom embroidery, monogram, silk screen and other promotional products. Vacations are a rarity. 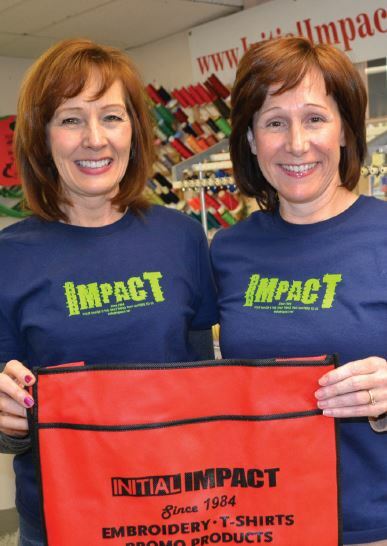 Sisters Donna Szakats (left) and Tammy Greg of Initial Impact are taking PC Skills classes. But Donna and her sister Tammy Gregg, who also works at the shop, are making time for training in Microsoft Word and Excel, two programs essential to the company’s back-office efficiency. They are able to afford this training through instruction offered by Brookdale Community College and the state’s Basic Skills Workforce Training Program, which is free to New Jersey employers and their employees. “Initial Impact liked the idea of getting free instruction for employees at Brookdale,” Tammy said at a recent class in Word 2013 conducted by instructor Fred Ambrose, a favorite among local companies due to his humorous, low-key and effective teaching style. Tammy is learning Word so she can also do clerical work forthe family business. Jim McCarthy, Brookdale’s business training manager, said the Basic Skills program and its open-enrollment feature are popular with local businesses. More than 1,300 employees with 62 companies received Basic Skills training from Brookdale in 2013. Consortium Executive Director Sivaraman Anbarasan said the state’s 19 community colleges make the program a success with excellent instruction. “These instructors are tops in their fields,” he said, noting that classes are offered in PC skills (Word, Outlook, Excel and PowerPoint), communications (written and verbal, including customer service), English as a second language, Spanish in the workplace and mathematics & measurement. This story was originally published in the April 2014 issue of New Jersey Business, the magazine of the New Jersey Business & Industry Association. The author is Christopher Biddle, President of Biddle Communications & Public Relations.